The light at the end of the tunnel that is the transition to Spiritual Consciousness. 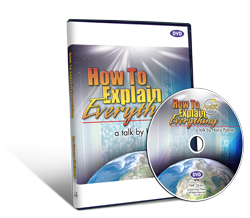 This talk was recorded live at the September 2009 Master Course in Lake Mary, Florida. "Now at the lower end, the mixture of physical universe and awareness is called “Animal Consciousness”, in the middle, the mixture of physical universe and awareness is called “Intellectual Consciousness”, and at the top, the mixture of physical universe and awareness is called “Spiritual Consciousness”. So you have three domains here. And as you go up from the physical universe, up this line, the influence of the physical universe becomes less, and the influence of infinite being becomes greater. Most respected teachers will tell you that the most important undertaking of life is the journey that you make across these three domains. The Buddhist follows the path of dharma, which means in essence, taking those actions that you believe will result in the most good. Always do what you believe is right. This has a strong element of personal responsibility, because what you believe is right depends upon where you are in a domain." For people looking to take control of their life.